Roll out puff pastry into a rectangle. Cut 10 strips. Mix cinnamon and sugar together. Brush pastry with butter. Sprinkle sugar evenly on top of butter. On bottom half of each strip evenly divide mint chocolate chips and press into pastry. Fold in half from top to bottom pressing edges together. Twist each pastry and place on baking sheet. Whisk egg and brush the egg onto each pastry. Bake for 12 minutes. Set aside to cool. Mix together powdered sugar, milk and food coloring. 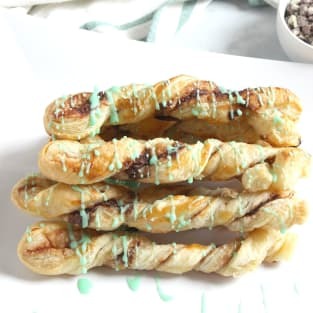 Drizzle on cinnamon sticks. Serve and ENJOY!